It feels like cheating to do another picture-heavy post this month, but there was just too much going on to pack it all into the last Bloom Day extravaganza. So, here are the missing combination and garden shots for August, starting in the front garden. I have a lot of fun experimenting with bright colors out front, but to my eye, bright colors alone aren’t very satisfying. 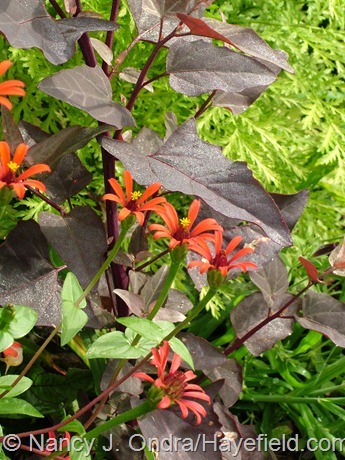 The more dark foliage I mix in, the more I enjoy the high-impact flowers. Some of the experiments work perfectly from the get-go; other still need some tweaking. This spot by the front gate got a little too heavy with the purple foliage, but the bits of red and scarlet help to perk it up a bit. 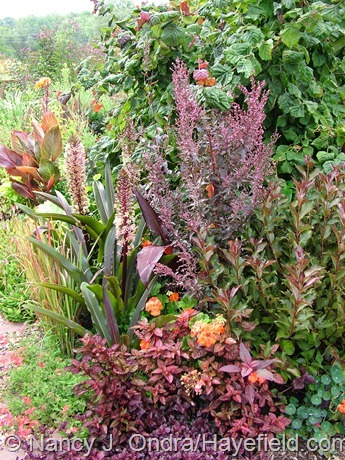 Going clockwise from the top right: ‘Red Majestic’ contorted hazel (Corylus avellana), red orach (Atriplex hortensis var. 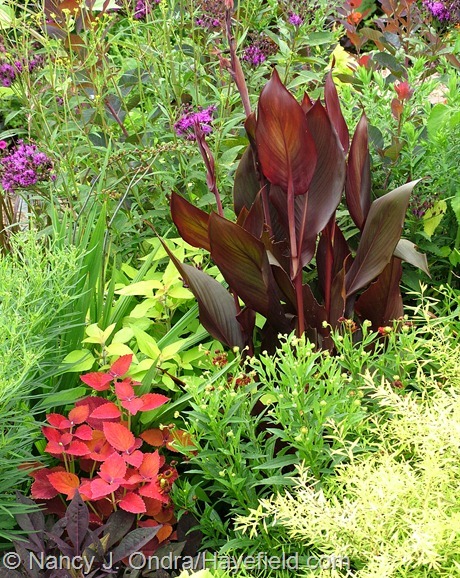 rubra), Fine Wine weigela (Weigela florida ‘Bramwell’), ‘Black Velvet Red’ geranium (Pelargonium x hortorum), ‘Red Splash Select’ polka-dot plant (Hypoestes phyllostachya), Babylon Red verbena (Verbena ‘Oxena’), Japanese blood grass (Imperata cylindrica ‘Rubra’), ‘Oakhurst’ pineapple lily (Eucomis comosa), and Tropicanna canna (Canna ‘Phaison’). 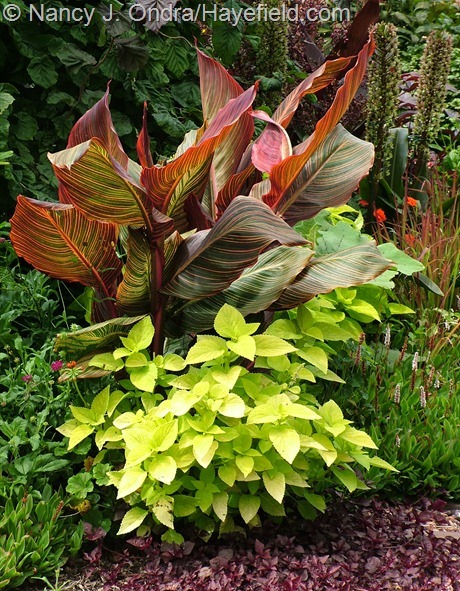 I kind of like this one, but I wish that the red flowers and yellow foliage in front of the ‘Intrigue’ cannas had gotten taller than the Japanese blood grass along the front, as they were supposed to. 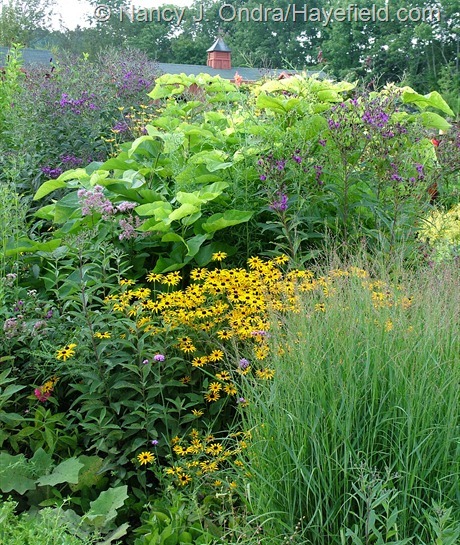 This one is also a bit heavy on the burgundy from the ‘Mahogany Splendor’ hibiscus (Hibiscus acetosella) and Japanese burnet (Sanguisorba tenuifolia), but the touch of orange ‘Coppellia’ sneezeweed (Helenium) and abundance of green brightens it up a bit for now, and it’ll look even zippier when the purple ‘Hella Lacy’ New England aster (Symphyotrichum novae-angliae) behind the hibiscus begins to bloom. In other spots, I wish I had included a bit more dark foliage, though a single clump can be all the more striking as an accent in a sea of bright blooms. 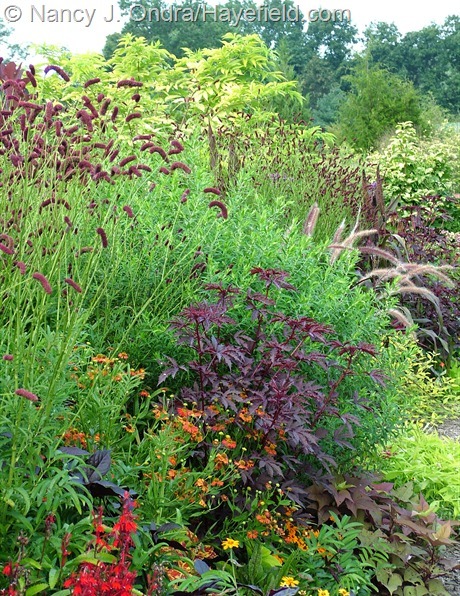 Above is ‘Jester’ purple millet (Pennisetum glaucum) with cardinal flower (Lobelia cardinalis), Brazilian vervain (Verbena bonariensis), ‘Sedona’ coleus, Pentunia integrifolia, and ‘Profusion Yellow’ zinnia. 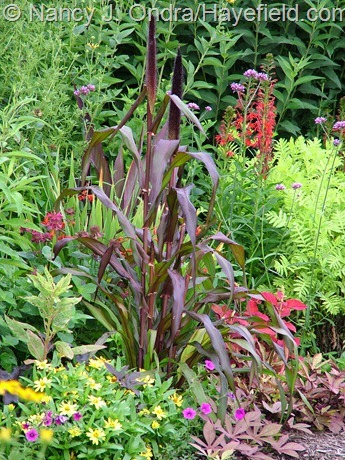 Below is ‘Australia’ canna with just-about-to-bloom ‘Ruby Tuesday’ sneezeweed (Helenium), Mellow Yellow spirea (Spiraea thunbergii ‘Ogon’), ‘Sweet Caroline Purple’ sweet potato vine (Ipomoea batatas), ‘Sedona’ coleus, ‘Golden Delicious’ pineapple sage (Salvia), and ironweed (Vernonia). Moving into some more contrasty combos…above is ‘Red Spider’ zinnia (Zinnia tenuifolia) against red orach (Atriplex hortensis var. 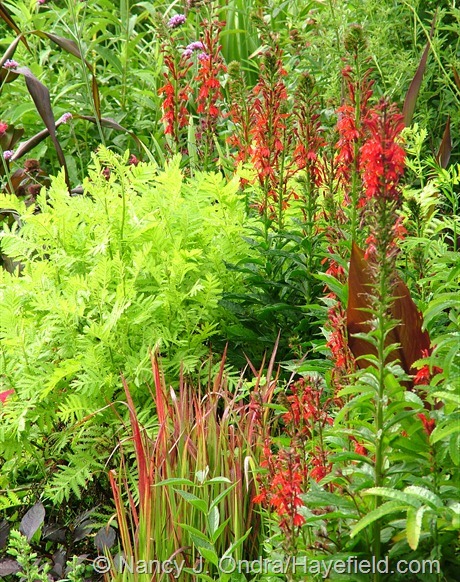 rubra) and ‘Isla Gold’ tansy (Tanacetum vulgare); below is more of the tansy with cardinal flower (Lobelia cardinalis) and Japanese blood grass (Imperata cylindrica ‘Rubra’). 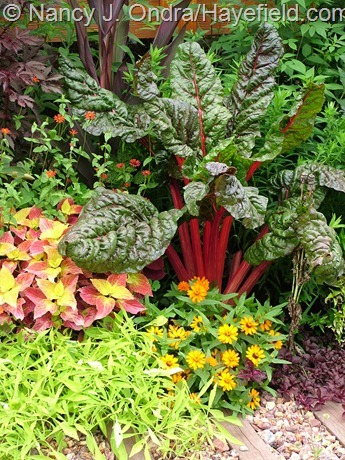 A red-stemmed seedling from the ‘Bright Lights’ Swiss chard seed strain is the star of the above grouping, with ‘Profusion Orange’ zinnia, ‘Emerald Lace’ sweet potato vine, ‘Bellingrath Pink’ coleus, and ‘Red Spider’ zinnia. 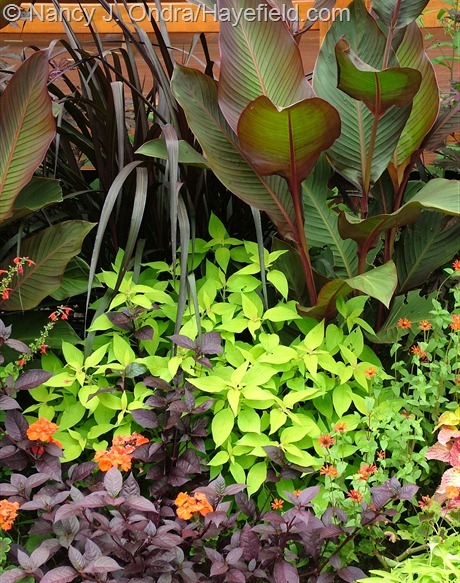 Right across from that collection is this grouping of Tropicanna canna (Canna ‘Phaison’), ‘Lifelime’ coleus, and ‘Purple Lady’ beefsteak plant (Iresine). ‘Lifelime’ was a new coleus for me this year, and I like it, but I don’t know if I’d spend the money to grow it again. 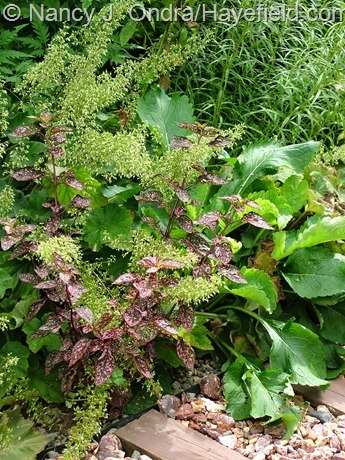 (It’s vegetatively propagated, and since I can’t manage to keep coleus indoors over winter, I’d have to buy new plants each year.) ‘Giant Exhibition Lime’ (also sold as ‘Giant Exhibition Limelight’) is just as good, I think, and you can grow it from seed. 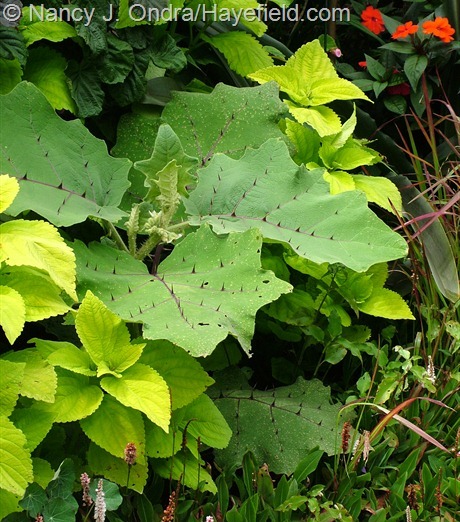 Above, it’s with bed-of-nails (Solanum quitoense). 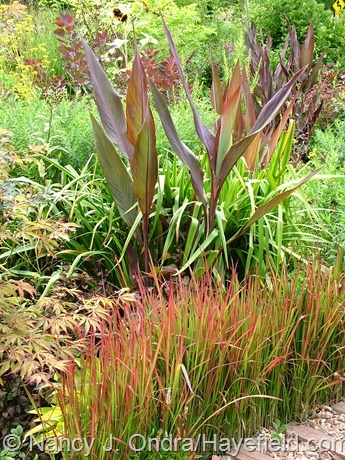 And below, one more high-contrast combo along the front path, with ‘Golden Delicious’ pineapple sage surrounded by Canna indica ‘Purpurea’, ‘Red Spider’ zinnia, ‘Purple Knight’ alternanthera, ‘Black Velvet Red’ zonal geranium, and Vertigo fountain grass (Pennisetum ‘Tift 8’). If those were a bit too retina-searing for your tastes, how about something a little milder? Well, ok, orange coneflowers (Rudbeckia fulgida var. 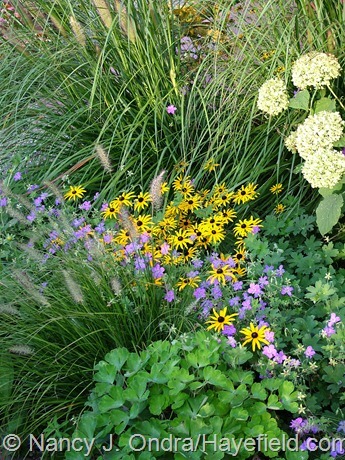 fulgida) are still bright, but pairing them with grasses adds some soothing greens and blues. Above, they’re tucked between ‘Little Bunny’ and ‘Hameln’ fountain grasses (Pennisetum alopecuroides), along with the heads of ‘Anabelle’ smooth hydrangea (Hydrangea arborescens), blue-purple Geranium wlassovianum, and light green columbine (Aquilegia) foliage. 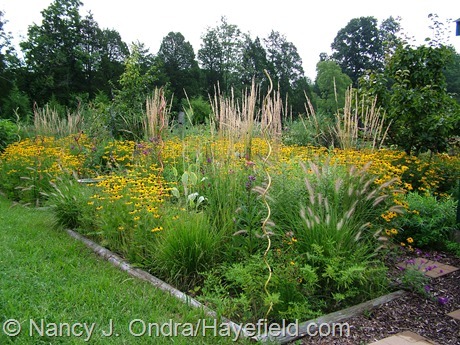 Below, the orange coneflowers are behind ‘Rotstrahlbusch’ switch grass (Panicum virgatum) and in front of golden catalpa (Catalpa bignonioides ‘Aurea’) and giant ironweed (Vernonia gigantea). Above, orange coneflower in front of frost grass (Spodiopogon sibiricus) and golden elderberry (Sambucus nigra ‘Aurea’); below, it’s with ‘The Blues’ little bluestem (Schizachyrium scoparium), ‘Dewey Blue’ bitter switch grass (Panicum amarum), ‘Karl Foerster’ feather reed grass (Calamagrostis x acutiflora), and ‘Northwind’ switch grass (Panicum virgatum). Farther along in the same border, more orange coneflowers mingle with purple coneflowers (Echinacea purpurea) and the dark seedheads of Carolina lupine (Thermopsis villosa). 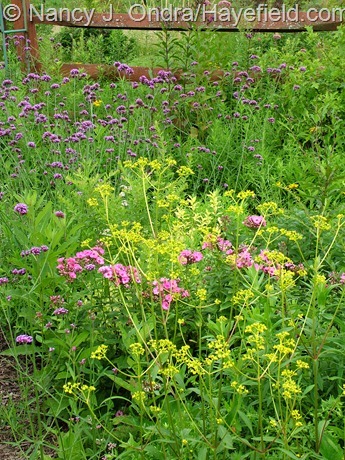 Below, another pink-and-yellow combo – this time, ‘Ping Pong’ phlox (Phlox x arendsii) and golden lace (Patrinia scabiosifolia) – with a swath of Brazilian vervian (Verbena bonariensis) along the back. 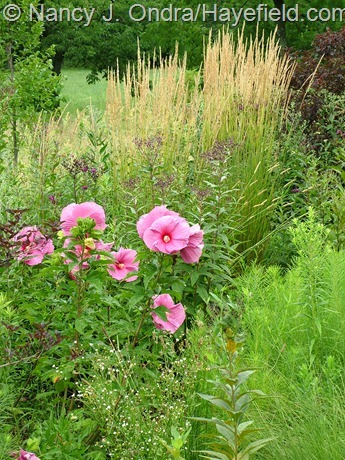 …and ‘Plum Crazy’ rose mallow (Hibiscus) – below with ‘Karl Foerster’ feather reed grass (Calamagrostis x acutiflora) and New York ironweed (Vernonia noveboracensis). There are a few cool blues and grays this time of year, too, mostly in the side garden. Above is cut-leaved chaste tree (Vitex negundo var. 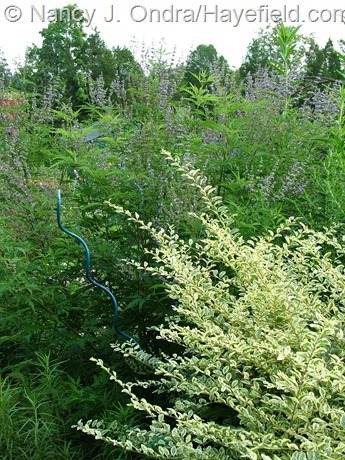 heterophylla) behind ‘Swift Creek’ privet (Ligustrum chinense). 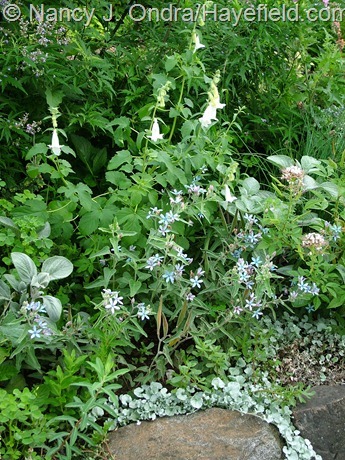 Below is tweedia (Oxypetalum caeruleum) with white South African foxglove (Ceratotheca triloba ‘Alba’), silver spurflower (Plectranthus argentatus), and ‘Silver Falls’ ponyfoot (Dichondra argentea). 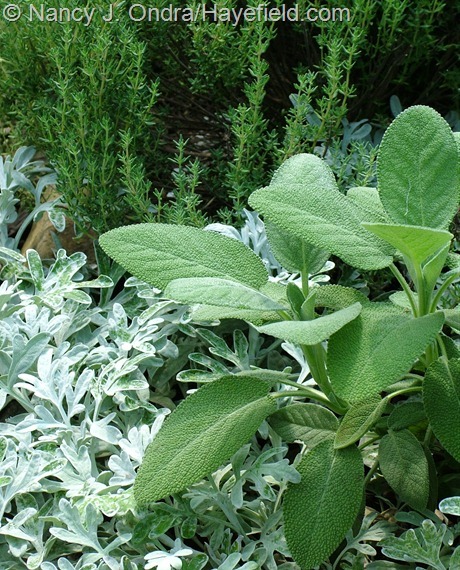 Oh, and one more from the herb garden: below, broad-leaved ‘Berggarten’ sage (Salvia officinalis) with lacy white ‘Silver Brocade’ (‘Boughton Silver’) beach wormwood (Artemisia stelleriana) and tiny-leaved French thyme (Thymus vulgaris). 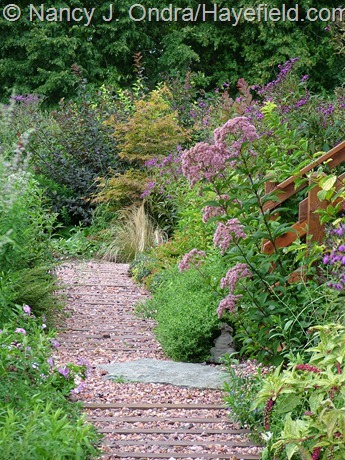 And finally, a quick trot around the garden for a general tour, starting with the front path, below. Above is the path that runs through the middle of the front garden; below is a closer-up shot of one side. Above, the diagonal path that separates the front garden from the side garden. Below, the path that runs along the side of the house. This is one of my favorite views of the side garden. 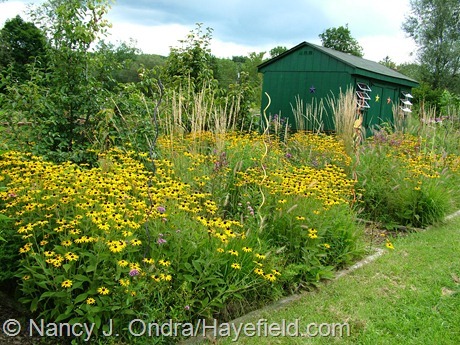 Right now, the interest is mostly from the ‘Queen Red Lime’ zinnias, fountain grass (Pennisetum alopecuroides), orange coneflowers, and golden lace (Patrinia scabiosifolia), but it’ll look really good in another 2 weeks or so, once the asters and goldenrods start flowering. 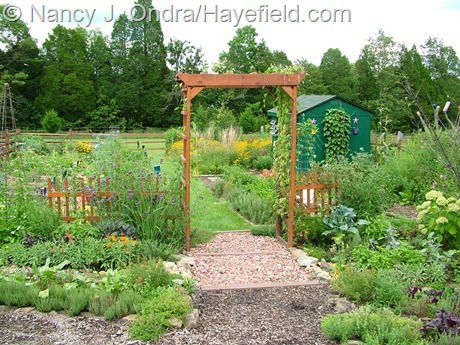 Below, the arbor that leads out to the veg garden area. The perennial meadow squares out back, which were new last year, and looking terrific this year. 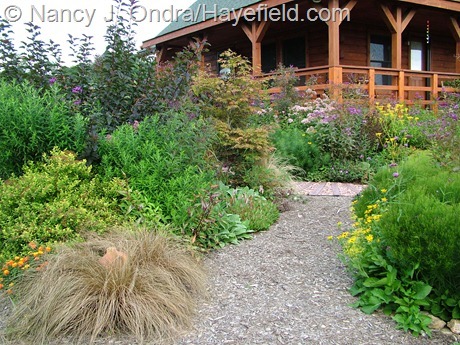 Here too, there’s still a lot of color to come from the fall-blooming flowers and grasses. Out in the courtyard, between the house and the barn, the ‘Black Beauty’ Orienpet lilies (Lilium) were lovely through the first two weeks of August. 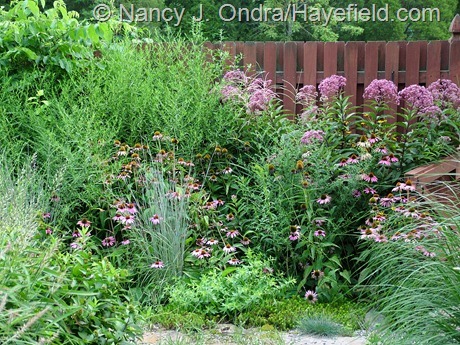 There’s still lots of other pink out there (just by chance, not by design), thanks to the purple coneflowers and Joe-Pye weeds. Well, that’s more than enough, I think. Now, some of the fall bloomers better come along quickly, so I have something different to show you for September’s Bloom Day. Thanks for visiting! I love all these purple foliage combinations Nan, especially in the second picture ! And white Ceratotheca ! I was only used to grow the pink one. I just collected a lot of seed from both forms of Ceratotheca, so I’ll have plenty to share this fall. I’ll set some aside for you if you’d like to try the white one. With great pleasure Nan ! Thank you. I’m planning to offer a bunch of seeds again this fall, so I’ll make sure you get to see my list too. Thanks! So beautiful! 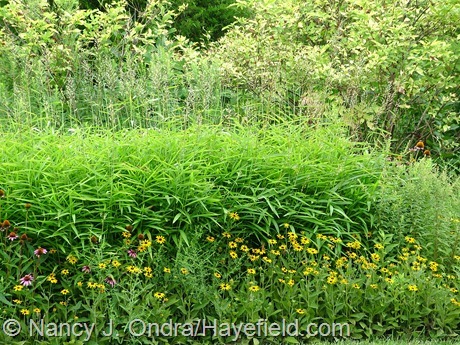 I love when you identify so many great plants — makes it easy to add things to my “want” list for next year! Oh wow, Alan, you’ve set an interesting new challenge for me. I will definitely have to learn how to do that! Seeing that you use a lot of seeds to start your garden plants makes me want to try some. I don’t seem to have such luck. Do you start yours indoors or do you plant right into your garden? I love all of these color combos. Very exciting to see. To be honest, Lisa, I don’t have tremendous luck sowing seeds directly in the garden. I normally sow seeds indoors in March and April (no fancy setup – just two old 4-foot shop lights here in my office), or outside in June through August. Once I get them into the garden, the self-sowers then keep themselves going from year to year. Just beautiful. I love your color combinations. Do you take care of your property all by yourself? I grew the red spider zinnias from seed you sent me. I just love it. I’m so glad you’re enjoying those zinnias, Melanie. They have a lot of personality. I do take care of the garden mostly by myself, but Mom helps out with the weeding and path-mulching sometimes, and with the regular mowing. I have a few request for seeds. Do you have seed for phuopsis stylosa? Also that BED of NAILS is pretty interesting. I kind of doubt I’ll have any of the Phuopsis, because its main flush of bloom has been over for quite a while, but I’ll keep an eye on it and grab some seed if I can. I hope to get lots of seed from the Solanum quitoense; it depends on whether the fruits mature before frost hits. Thanks for asking so I can add them to the “watch list,” Melanie. Thanks Nan. You’re the best. I have ‘hearts and honey’ morning glory seeds and cardoon seeds if you’re interested. I’m happy to share what I have with no swap in return, Melanie. I will say, though, that I’ve had a great time playing with the seeds that I unexpectedly received from some participants in last year’s event. So I won’t ask for an even exchange this year either, but if anyone has seeds of a plant they really love and want to share them with me in return, I won’t say no! Thanks for sharing your lovely combos. They are beautiful! It gives me ideas and inspiration for my own garden as a rookie. I see lots of plants I want to try. Isn’t it amazing how many plants look fantastic this time of year? I’m so pleased that you got some ideas for your own garden, Cheryl. If it’s your garden and your photos, it’s never cheating. I loved the shots and grateful for the lists of plant names in the photos. Thanks, Jim. Some of those lists got pretty long, but since many people seem to miss that the ID info is available when they put their cursor over each photo, I figured it was worth putting it in the text as well. It’s not quite as idyllic as you may imagine, Donna, but yes, it’s pretty amazing to be up on the porch and look out at the garden right now. I’ll have to try creating some panoramic shots from that angle. Thanks for visiting today! I think it’s looking quite good for a generous harvest of tweedia seed, so yes, I’ll to add it to the list. I hope that you (and other readers) won’t be shy about speaking up about any other plants you’re interested in. If I think they’ll come true from seed, and if I *can* collect seed from them, I’ll be glad to do that. It’s *so* much easier to know now what people might want! I’ll try to keep track of these early requests, but if I get lots of them, I may need to ask everyone to speak up again when I post the complete list of offerings this fall (probably late November, as I did last year). And, I haven’t forgotten about the “Neat Plants” posts: I have a bunch saved up for this winter! Your photos are lovely and an inspiration to me. I love your color combinations! What would really be a treat is to see your garden in person. 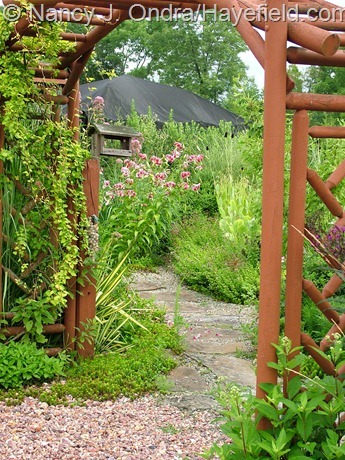 Do you ever have garden tours? 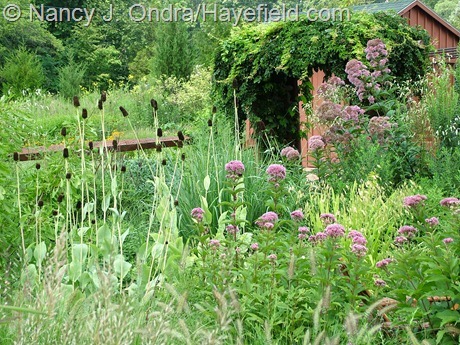 If not I am still thrilled to see your garden through your blog. Hey, thank you so much for the comment. 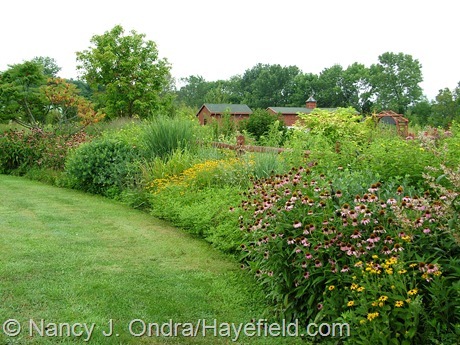 I have no plans for garden tours, but you can be sure that I’ll post plenty more pictures this fall, so you’ll get to see whatever looks best. Your combinations are absolutely stunning and my number one source for inspiration. 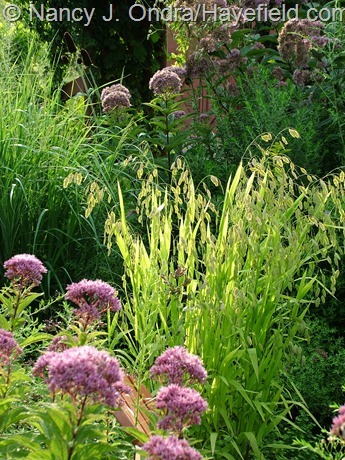 More than anything else, I love what the ornamental grasses do to these combinations. They lend such an airyness (sp?) 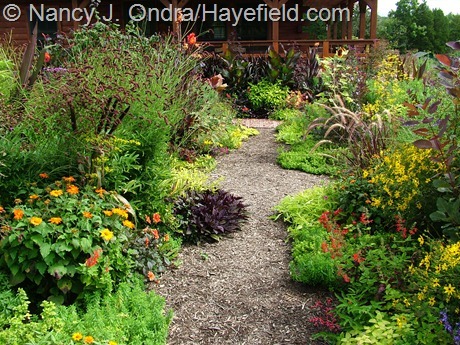 and calming affect to all of the surrounding flowers and dark foliage. This is what gardening is all about! Thank you so much for sharing. Goodness, John, I’m honored. You’re right about the grasses, of course, especially at this time of year. 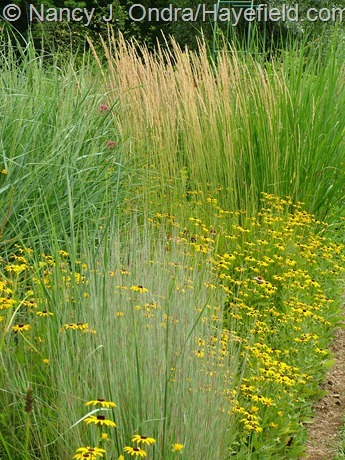 In some of the borders where several different grasses have ended up next to each other, there’s not much to catch the eye through spring and summer, but now that they’ve reached their varying heights and forms and have started producing seedheads, the subtle differences make for some really intriguing effects. I bet your horses enjoyed munching on those fresh, juicy shoots just as much as you enjoyed looking at them. Let’s hope they get distracted once their pasture grass grows back. Happy spring to you, Kerry! Nan, I am amazed that you can care for all this pretty much by yourself! And your choice of lighting for the photos is superb! I relax so much just gazing at your site. Thank you! Welcome, Shenandoah, and thanks! Really, the garden pretty much takes care of itself this time of year. Though somehow I do manage to spend several hours puttering around out there every evening…. 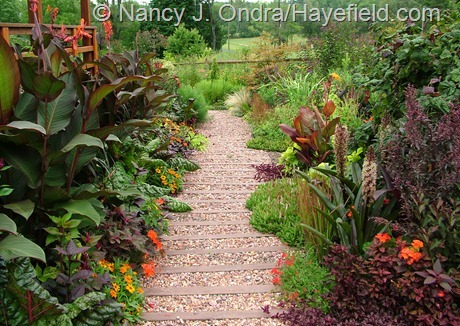 Beautiful pics of a beautiful garden! I must ask, how do you keep your swiss chard looking so beautiful in the garden? I feel like everytime I plant outside of my walled vegetable garden, all I’m doing is setting out treats for my groundhogs! Any tricks?!?!? I wish I could share some great secret, Seth, but it’s basically just luck. I have the opposite situation: if I plant chard in the veg garden, the rabbits get it, but when I mix it in with the ornamentals in the front garden, it usually escapes their depredations. I will say that a yearly topdressing of 3 to 4 inches of alpaca manure in that front foundation border works wonders for producing mega-chards, which can withstand quite a bit of nibbling if the rabbits do find them. On the down side, the huge chards are apparently candy to voles, which sneakily hollow out their crowns, eventually leading to the plants imploding with little or no warning. I wish I could jump into the computer and miraculously land in your garden, open up a cold “one” and just stroll all around ….for a whole day…..heck, for a whole gardening season! Be careful what you wish for, Jeannie – if you did that, I just might put you to work! Hello, Nan; thanks for all the wonderful plant combo pics again! I took notes on purple foliage ideas for next year. That spider zinnia sounds interesting from the above comment; will you have seeds this year? 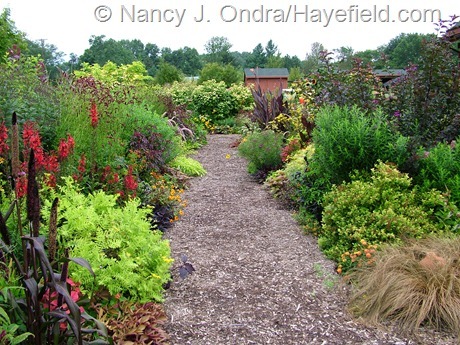 Thank you so much for sharing your garden in all ways! Glad that you found some new things to try, Donna. Definitely, I plan to have seeds of the ‘Red Spider’ zinnia to share this fall. Thanks for the awesome pictures…. nothing witty or intelligent to say, just everything looks great and love the combos! No cleverness necessary, Frank – I really appreciate your comment just as it is! 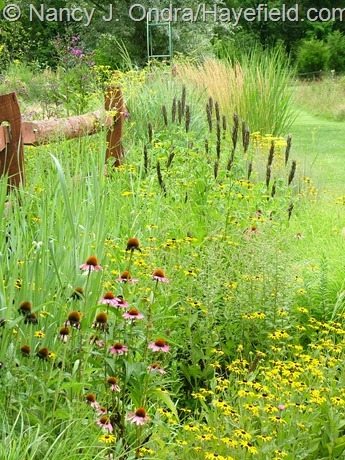 Your garden is absolutely stunning! so even if my garden also are looking good this time of the year, its miles from yours!! As long as you feel happy with your own garden, Susie, that’s all that matters, right? I hope you have a lovely autumn. Truly inspirational! Beyond the beauty of those photos, your captions identifying the plant materials is exceptionally helpful for those of us learning more and more plants. 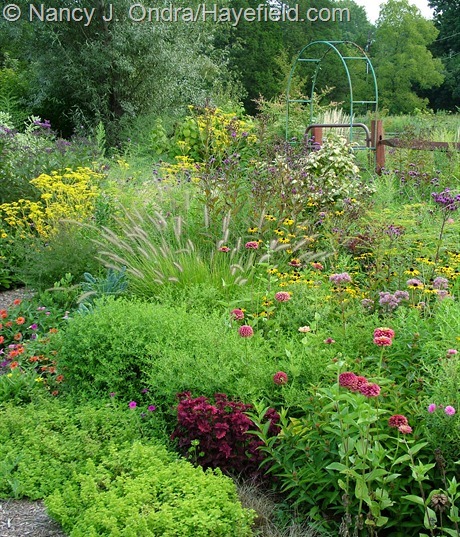 And your mix of perennials and annuals, whether self-sown or planted, makes a great case for experimentation. I’m sure what’s serendipitous brings you as much if not more satisfaction than the carefully planned harmonies/contrasts. The result is obviously an ever-changing tapestry that draws you back frequently. I know I’m hooked on revisiting your blog! I’m glad that you came back, Eric. You’re absolutely right: the happy accidents are much more interesting and exciting than many of my planned combinations. I’m still hoping that the tapestry will change enough in the next week to make September’s Bloom Day worth seeing. Your photos are always so beautiful – inspiring and instructive. You always give me new ways of looking at the garden and new ideas. Thanks so much, Pat! Great to hear from you. Hope you’re having a great growing season! I appreciate so much the time you put in to show us so many photos and to name every plant in them. 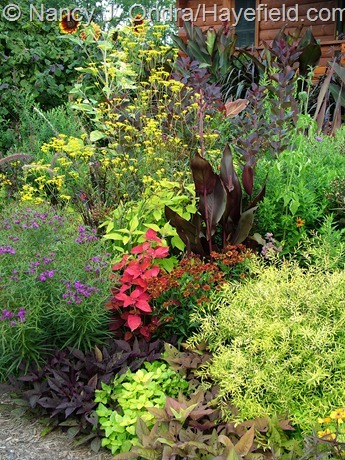 I love your vibrant colour combinations and although many of your plants aren’t available here, I can still be inspired by your planting style. I look back through your posts often and make notes. That’s so good to know, Lyn: I sometimes wonder if it’s boring to include all that detail with the plant names. Have a great spring! this is actually my first official post, though I regularly check your site. Very nice as always. Have had great luck with the seeds you sent last year, so many neat things. I have a couple of unusual things I got from a contact in the UK ( do you grow Lunaria?) that I have been meaning to share with you. Just wanted to mention as well I have S. quitoense in abundance right now, if you want to pass my e-mail along to Melanie or anyone else seeking seeds for it. I have plenty to share. Hi Rick! Great to hear from you. I haven’t had Lunaria in quite a few years and miss growing it. I’m always thrilled to try new things too. I’m hoping to list seeds to share again this fall. It’s so kind of you to offer the Solanum quitoense seed. The fruits on mine are still small and green, and I’m thinking that we’ll only have a few more weeks before frost, so it seems unlikely that I’ll have any to share after all.